With strange people and new smells, a trip to the vet can be stressful your dog. Here’s how to help them avoid vet fear. 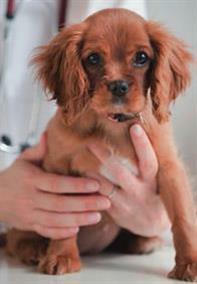 • Do regular home health checks so your dog gets used to being handled. • Use a positive voice to talk to your dog and reassure them. • Take treats to reward them for positive behaviour. If you have a puppy, remember that until they’ve had all their vaccinations you’ll need to hold them on your lap or in a crate in the waiting room to stop them coming into contact with other dogs. • any medication your dog is on.